deploymentramblings – Deployments, Automation, Fun. Recently, Andreas Stenhall posted a fantastic blog post showing some PowerShell code to identify applications that are dependent upon other runtime frameworks such as .NET for Visual C++. This got me extremely excited as Visual C++ 2005 is already End Of Life and VC++ 2008 will be going EOL early next year. Being able to quickly and easily identify applications that could be impacted if one or more of these legacy frameworks are removed has been, up until now, been primarily a manual effort. This post is designed to expand upon Andreas` work and extend his solution into SCCM where a majority of us actually manage our systems. The first step is to extend your ConfigMgr inventory to collect the proper WMI Class data during Hardware Inventory. To do so, open up your Configuration Manger Console and browse Administration > Client Settings > Default Client Settings and open Properties. Select Hardware Inventory and hit the Set Classes button. Hit OK thru the remaining windows to save your changes. During the next inventory cycle the information should begin to populate in your ConfigMgr Database. Now that we’ve inventoried the data, we need to do something with it. Creating a report is a great first start as we can start searching for applications running EOL or near-EOL frameworks and begin either upgrading those applications or working with the Application Developers or 3rd Party ISV’s to get them updated to use a newer framework. Now, for those of you who are used to writing SQL Queries and reports against inventoried data, I caution you to leverage the SQL Code below and/or the RDL I’ve attached to this post. The v_GS_INSTALLED_WIN_32PROGRAM View can get HUGE. This in turn dramatically slows down the SQL. Especially in an environment with tens of (or hundreds of (thousands of clients. The above query is what I use within the report. You will notice two SQL Parameters which correspond to the FrameworkName and FrameworkVersion that you want to query against. This allows you to search for systems based on a specific framework and version (think EOL hunting). Download Report – You’ll need to update the datasource within Report Builder and point it to your own data source. In the report you are provided with two parameter options. Framework Name – This is the name of the actual framework as gathered by Hardware Inventory. None of this is “normalized” though you could do that in the SQL query if you wanted to. Framework Version – I’ve configured this as a multi-select parameter option so you can look for multiple versions of a particular framework in one go. NOTE: Please ensure you change the Data Source to point to your own ConfigMgr Data Source. Now that you have access to the data, you can begin identifying applications that are dependent upon older versions of software frameworks including Visual C++, Java, etc. From there, start building collections of systems that have these older applications installed to handle upgrades as well as the (eventual) removal of the legacy run times. I was at the Midwest Management Summit at the Mall of America (#MMSMOA) this past week and met a ton of people. Many of whom I have conversed with over Twitter and even more that I haven’t. If you haven’t been to MMSMOA, I highly suggest you go next year (May 2018!). At the end of one of the sessions, I engaged in a discussion about deploying software/updates to a Device Collection based on the systems Primary User. Well, I promised I would post a blog so here it is. To do this, we will leverage the User Device Affinity (UDA) functionality of ConfigMgr. If you are unfamiliar with User Device Affinity, I suggest you read https://docs.microsoft.com/en-us/sccm/apps/deploy-use/link-users-and-devices-with-user-device-affinity first to familiarize yourself with the technology and how to configure it in your environment. An Active Directory Security Group of user objects you wish to query against. This group must be enabled in Active Directory Group Discovery located within Hierarchy Settings. Warning: Be very careful when configuring your collection. It’s possible for UDA to be enabled (either manually or via Client Settings) on both Clients and Servers. Be sure to configure your Limiting Collection appropriately to ensure the end result contains ONLY the systems you expect. There is a caveat to this whole process. If using Client Settings to configure automatic discovery of Primary Users, you won’t catch everything right away. This functionality is based on system usage over a period of time so it’s possible the relationships could fluctuate over time depending on how the system is used. Too the people I spoke with at MMSMOA, and for everyone else, I hope you find this useful. If anyone reading this has a more accurate query, please post in the comments and share the love. 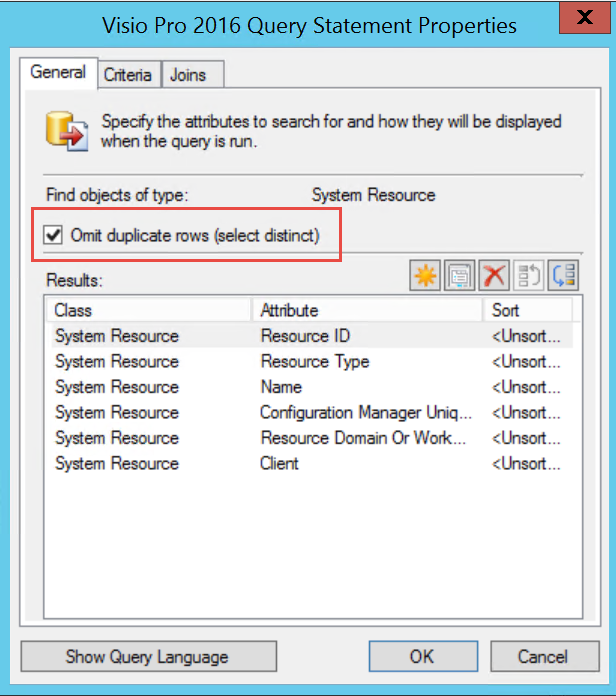 SCCM Collection Queries Running Slow? Split ‘Em up! 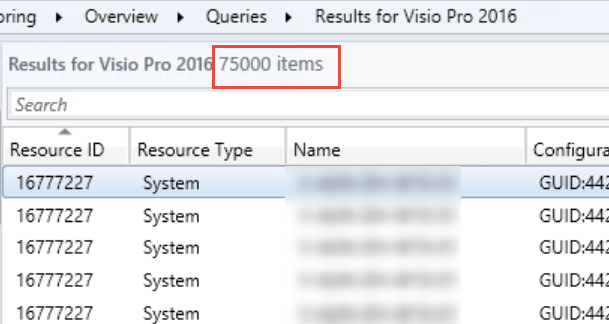 Like many of you, my SCCM environment contains a rather large number of collections (1000+). These collections are used for various purposes from identifying systems with certain Software installed, or identifying systems by Hardware Attributes such as Make, Model or Free Disk Space. Ok, now that you are all caught up on the various Collection Membership Rules, I want to dive into the Query Rule a bit further. Again, Microsoft has some information on How to Create Query Rules. If you are unfamiliar with this process, please read up before continuing. Lets say your environment has 10,000+ clients and you need to define a collection of systems that have Microsoft Visio Professional 2016 installed. Lets lay out the criteria for this collection before we build it. The collection should be updated once per day and NOT use incremental updates. As you can see from the above query, we are looking at both the 32-Bit and 64-Bit ADD_REMOVE_PROGRAMS WMI class. Once the new collection is created, it will take a few moments for the Collection Evaluator to update the collection membership so we can see how many systems we have. Each environment will vary on how long it takes to execute this query, and how many members the collection has once it has updated. The Collection Evaluator is the Site System component responsible for executing Collection Membership Queries and ultimately keeping your collections up to date. 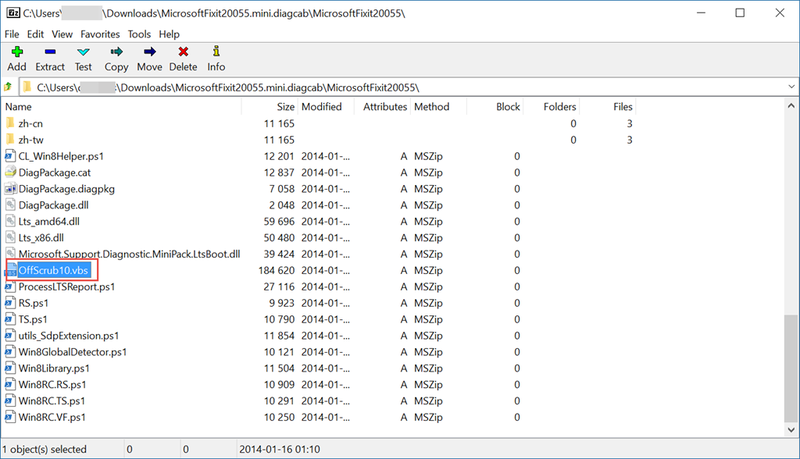 Microsoft has an excellent tool that comes with the ConfigMgr Toolkit called CEViewer.exe which can be used to see all of your collections and details about their most recent evaluations. 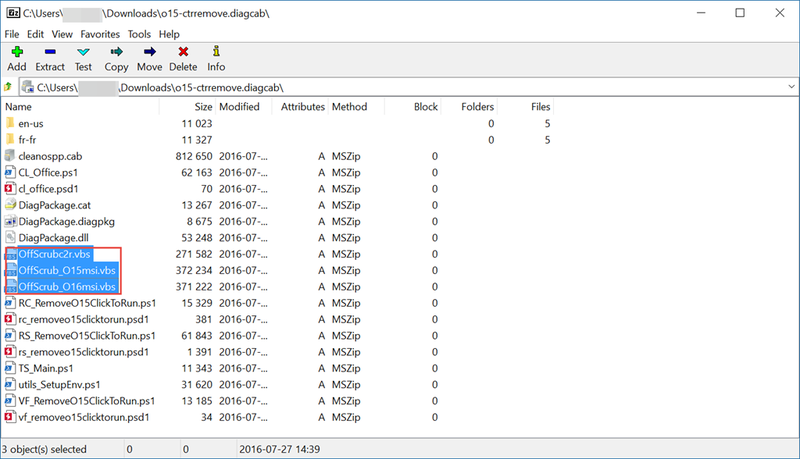 Microsoft has a nice post on How to use CEViewer.exe. If we open CEViewer on our Site Server and look at the last evaluation time for our new collection, we can see how much time it took for that evaluation to occur. In our case here, we see that it took 28.18 seconds to evaluate. You may be asking what is an “acceptable” threshold for collection evaluations. Unfortunately, I haven’t seen anything from Microsoft on the subject so here is my own personal recommendation. If a collection evaluation takes more than 20 seconds, you should look at optimizing the query rules. Help! My collection evaluations are taking too long! Split up your Query Rules into individual Queries. Lets start with the first item. Using SELECT DISTINCT on all your query rules ensures that when a query rule is evaluated, each potential system will only be returned one time. We can see the behavior of this using the Monitoring > Queries node in the ConfigMgr console. Lets take a look at the difference between these two queries. First, the “bad” way. If we copy the query rule from above into a new Query Rule (Monitoring > Queries > New Query Rule) and execute it, we can see from the following screenshot that each Resource ID gets returned multiple times. In this instance, they were each returned 59 times! Now, lets try it using SELECT DISTINCT. After running this new query, you can see that each Resource ID is only listed once and the total execution time is waaaay less. Now, lets go back to our collection and change it to use SELECT DISTINCT. There are two ways you can do this. First, is to edit the WQL directly as I’ve shown above. The other (easier) way, is to just check this box. And if you ask me, this should be checked by default! The second way to speed up your collection evaluations is to split up your query rule into multiple query rules. In our example, we are joining three different WMI classes (SMS_R_SYSTEM, SMS_G_ADD_REMOVE_PROGRAMS, SMS_G_ADD_REMOVE_PROGRAMS_64). Running this query essentially pulls all results from all three classes, checks for the matches against DisplayName and THEN finally pulls them into the collection. Even with SELECT DISTINCT, we are still having to pull ALL DISTINCT results from each class. To improve the performance here, simply split out your query against SMS_G_ADD_REMOVE_PROGRAMS and SMS_G_ADD_REMOVE_PROGRAMS_64 into their own queries. And don’t forget to use SELECT DISTINCT! select distinct SMS_R_SYSTEM.ResourceID,SMS_R_SYSTEM.ResourceType,SMS_R_SYSTEM.Name,SMS_R_SYSTEM.SMSUniqueIdentifier,SMS_R_SYSTEM.ResourceDomainORWorkgroup,SMS_R_SYSTEM.Client from SMS_R_System inner join SMS_G_System_ADD_REMOVE_PROGRAMS on SMS_G_System_ADD_REMOVE_PROGRAMS.ResourceID = SMS_R_System.ResourceId where SMS_G_System_ADD_REMOVE_PROGRAMS.DisplayName = "Microsoft Visio Professional 2016"
select distinct SMS_R_SYSTEM.ResourceID,SMS_R_SYSTEM.ResourceType,SMS_R_SYSTEM.Name,SMS_R_SYSTEM.SMSUniqueIdentifier,SMS_R_SYSTEM.ResourceDomainORWorkgroup,SMS_R_SYSTEM.Client from SMS_R_System inner join SMS_G_System_ADD_REMOVE_PROGRAMS_64 on SMS_G_System_ADD_REMOVE_PROGRAMS_64.ResourceId = SMS_R_System.ResourceId where SMS_G_System_ADD_REMOVE_PROGRAMS_64.DisplayName = "Microsoft Visio Professional 2016"
Now if we evaluate collection membership and go back to CEViewer, we can see that the evaluation time has drastically been reduced to well within our artificially defined “threshold”. To recap, use CEViewer to keep an eye on your Collection Evaluations. In addition, when creating your collection queries make sure to use SELECT DISTINCT and split out your query rules to improve performance where possible. Author dhedgesPosted on January 19, 2017 January 18, 2017 Categories CM1606, ConfigMgr, SCCM, SCCM 1606, SCCM 2012, UncategorizedTags Collection, Query1 Comment on SCCM Collection Queries Running Slow? Split ‘Em up! Earlier this year I did a presentation at the Central Texas Systems Management User Group (CTSMUG) in Austin on migrating our company to Office 2016 (MSI). I have provided a link to my Sway of that presentation for some general context however this blog post will be a more technical explanation of how I went about upgrading all our systems to Office 2016. Working knowledge of ConfigMgr 2012/Current Branch Task Sequences. Before we get going, we need to create a new package called “Office 2016 Upgrade Files”. This package will consist of detection scripts, Office Scrub scripts and any other custom code used for your overall upgrade process. (NOTE: This package should NOT contain any of the actual Office installer binaries). Get-MSOfficeProducts.ps1 – I developed this script to detect as many Microsoft Office (non-server) products that I had in my environment (NOTE: The language packs section needs improvement to cover more languages). IME14-Cleanup.ps1 – This cleans up registry keys associated with the Office IME (Input Method Editor). Start out by creating a new (empty) Custom Task Sequence. The first stage of our Task Sequence will include detecting the software currently installed on the system. This is broken out (generally) into two different groups. 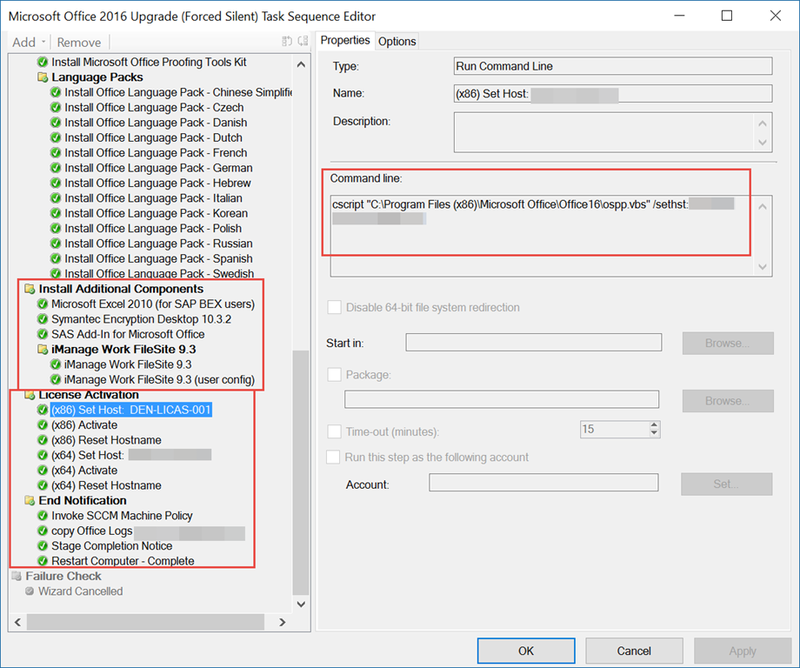 Office-Dependent Applications – Other software packages that have a dependency on one or more Office applications that may need special attention (reinstall) during an Office upgrade. The next section will contain various scripts and command lines that we’ll use to remove Office-Dependent products and Office itself. First off, create a group (generally via WMI query or a file check) to detect and remove each application. Be sure to add a custom Task Sequence variable as indicated in the screenshot above so you can use that to re-install the software later. You “CAN” upgrade Office in-place without removing previous suites, however I always run into legacy shared components that get left behind. When these are left behind, the system still downloads ALL of the updates for the full suite (including service packs) so I prefer to perform a rip and replace of the Office suite. Once you have removed the Office-Dependent applications, the next set of steps will systematically remove Microsoft Office. I’ll list this out in order of how we did it as we had excellent success with this specific order of operations no matter what the system had installed. Remove Microsoft Office – This uses the Get-MSOfficeProducts.ps1 script from the Detection step but with the added –Uninstall parameter. This step works well to remove Office 2003 components and some of the newer components using standard methods. NOTE: There is an Office Scrub script for Office 2003 available however I never verified that it worked. Uninstall Office 2007 – I used the main Office 2007 Professional Plus installation media with custom Uninstall XML files to remove SharePoint Designer, Proofing Tools and the rest of the suite (in that order) since I already had the original package used to install it. I’m not doing anything else related to Visio/Project or Language Packs during this section. NOTE: There is an Office Scrub script for Office 2007 available however I never verified that it worked. NOTE: The scrub scripts run twice as sometimes the scrub fails due to a corrupted installation. Running it twice typically takes care of things. NOTE: You’ll want to run the Office 2016/C2R scripts to remove any potentially conflicting applications before installing Office. C2R and MSI (2016) builds cannot co-exist. Before you start installing Office 2016/365, consider rebooting the system. This can often be required if you had to remove other Non-Office applications as part of your upgrade path. I’m using the Application Model for all Office installers. I have separate applications for the Office Suite separating 32-bit/64-bit. All other Office components have both 32-bit and 64-bit within the same application. 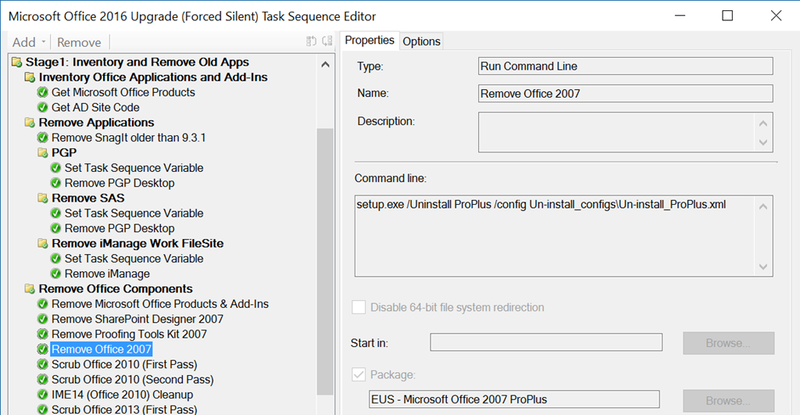 During this section is where we will leverage the Task Sequence variables created by the Get-MSOfficeProducts.ps1 script to determine which components to reinstall. Use the MsOfficeSuiteArch TS Variable to determine which architecture of Office to install. Use the MsProjectStd or MsProjectPro TS Variables to determine if Project Standard or Professional needs to be reinstalled. 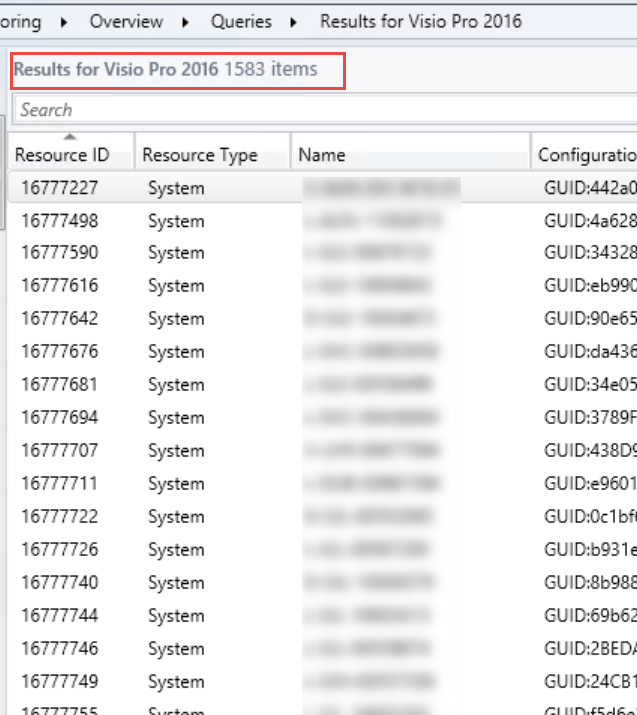 Use the MsVisioStd, MsVisioPrm or MsVisioPro TS Variables to determine if Visio Standard or Professional needs to be reinstalled. Use the MsProofKit TS Variable to determine if the Proofing Tools Kit needs to be reinstalled. 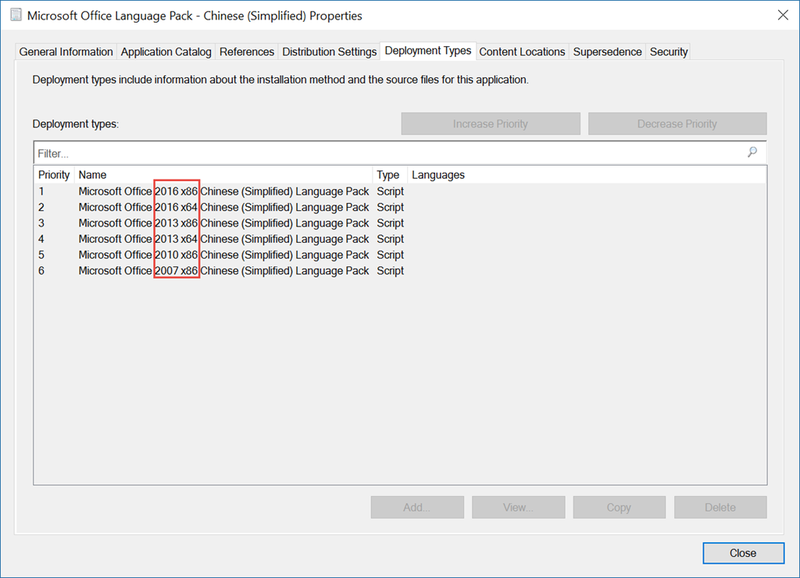 We use the Application Model for installing Office Language Packs. These are separated by Language, and contain Deployment Types for each Office Version/Architecture to make things easy (for us and the end user). Take note of the priority order. Here is where we begin reinstalling all of our Non-Office applications back onto the system. This could either be a simple re-install, configuration change, or an update to an application to enable compatibility with the Office 2016 suite. Finally, we end the deployment by forcing a machine policy update, copying off log files and notifying the end user that the upgrade is complete (Notification HTA runs via the RunOnce registry key). If you haven’t considered using Johan’s hydration kit or virtual router setup, you should. They are quick and easy (and repeatable). I rebuilt the lab environment to test the new CM1606 upgrade in an environment setup more closely to my production environment. After building the Domain Controller, Primary Site server and a couple clients to test with, it was time to start setting up all the necessary roles (Software Updates, Service Connection Point, etc.) and verify everything was working before testing the new CM1606 upgrade. After verifying that the basics were working, it was time to upgrade to CM1602 and then 1606 using the nice new In-Console Updates and Servicing Node. I checked the node, and it still said downloading. I waited a day, restarted SMS_EXECUTIVE service, even rebuilt the entire lab using new media. I found another post with this same error but I the suggested fixes didn’t help me any. I even tried the registry fix in the Release Notes. Nothing. Checking the EasySetupPayload directory I could see that the update files were actually downloaded. Checking the corresponding directory… rats. Empty. After a series of trial and error (and a bit of cursing), I stumbled across a solution to my problem. As part of the Virtual Router setup and overall lab configuration, I configured an Internal Hyper-V network for all my lab VM’s to run on. The Virtual Router was configured with two VM’s and setup in a NAT configuration so the LAB VM’s could get out to the internet. Here’s the issue (kind of). 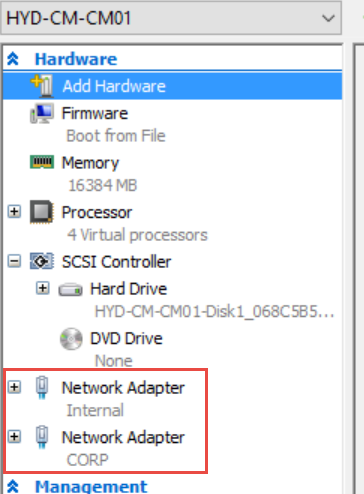 On my ConfigMgr Site Server, it was only connected to the Internal Hyper-V Network. So I decided to bypass the Virtual Router and add a second External (CORP) Network Adapter to the ConfigMgr Primary Site Server. After booting the VM back up, ConfigMgr was able to successfully download and extract the updates and I was able to proceed with the upgrade. So if you are using a Virtual Router for your ConfigMgr lab, make sure you give your Site Server direct access to the internet instead of routing it thru a Virtual NAT router. I’ve been running on ConfigMgr 1602 since it was released and have had my environment integrated with Microsoft BitLocker Administration and Monitoring (MBAM) 2.5 SP1 since day one. It’s worked wonderfully up until I applied the ConfigMgr 1606 in-console update. After the ConfigMgr 1606 update (Site Upgrade, not clients), I noticed an issue with the MBAM Supported Computers collection (which gets created as part of the MBAM + ConfigMgr Integration). There were only about 500 systems out of ~14,000 that were in the collection now! Over the next few days, that count slowly (and I mean slowly) grew to about 1,500 clients. The collection member count fluctuated a few hundred each day but never got above about 1,700 clients. I looked at the usual suspects like the Collection Evaluator being slow, WMI classes on the clients, and verified that clients were actually submitting Hardware Inventory (they were). Upon looking further, there was 1 SQL View that wasn’t fully populated. v_GS_TPM (Win32_TPM in HW Classes) is available for inventory right out of the box. However MBAM requires it to be extended to include 3 properties. This returned only about 600-700 rows out of nearly 15K! Checking some of the other MBAM Views such as v_GS_MBAM_POLICY or v_GS_BITLOCKER_DETAILS resulted in the proper number of rows. The solution I came up with was to simply force a Full Hardware Inventory Scan on every client. Once the clients forced a full update, they started showing back up in the collection and were happy again. Note: You’ll want to stagger this deployment so you don’t overload your site server(s)! Invoke-WmiMethod -Namespace root\CCM -Class SMS_Client -Name TriggerSchedule -ArgumentList "$HardwareInventoryID"
At the time this article was written I do not know the root cause but I have been talks with a PFE and members of the product group to track it down. I hope that this post will help others out there until the root cause can be determined and a fix put in place. Like most companies out there, my company is getting ready to migrate to Windows 10. As part of our migration, we are using IE Enterprise Mode to handle many legacy web applications to ensure our end users get the best experience possible, and reduce the manual effort to ensure they are using the proper browser (and browser mode). IE Enterprise Mode includes the ability to automatically re-direct sites from Microsoft Edge to Internet Explorer on Windows 10. This is fantastic for those who choose to use Edge as their default browser (as I do). This post will not be covering exactly HOW to implement IE Enterprise mode as there is plenty of that documentation out there on the web. Instead, I’ll be focusing on a recent discovery that my colleagues and I made. You’ve spent the last several months working with business partners to come up with a customized MS Edge redirect XML file and are ready to implement the file via GPP (or Compliance Settings or any other method you choose to set the registry key). You choose to set this on a Per-User basis because you want it to follow the user, not the machine (don’t ask why, just assume this is the reason). In addition to the above, you are running System Center Configuration Manager build 1602 (v1511 may also be affected – see below). You expect this new XML file to redirect your custom LOB apps, but it doesn’t. Upon further inspection within Edge (HINT: Use about:compat in the URL bar of Edge), you ONLY see entries for your site server (specifically the server hosting the Application Catalog site). 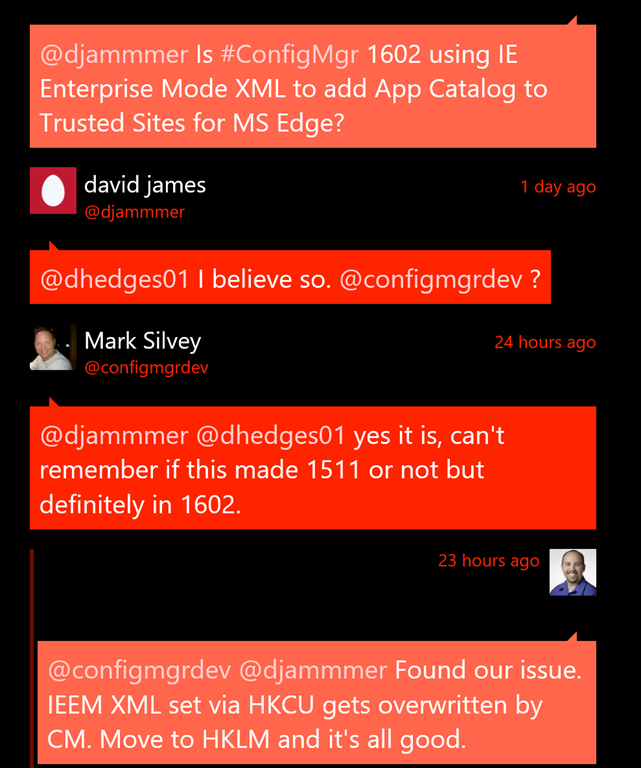 I messaged David James (@djammer) on the ConfigMgr Product Team to confirm that the ConfigMgr Client Settings to add the Application Catalog URL in Trusted Sites is, indeed, using an MS Edge redirect XML file similar to that from IE Enterprise Mode. As you can see from that last tweet, the solution (workaround really) is to set the reg key using the same path in the HKEY_LOCAL_MACHINE hive instead of HKEY_CURRENT_USER. Doing so allows your custom IE Enterprise Mode XML file to load and not be overwritten. I hope this information can help someone else out there. IE Enterprise Mode and ConfigMgr are awesome products and will be integral to a successful migration.